by O'Connor, Karen; Sabato, Larry J.; Yanus, Alixandra B. NOTE: You are purchasing a standalone product; MyPoliSciLab does not come packaged with this content. If you would like to purchase both the physical text and MyPoliSciLab, search for ISBN-10: 0134114027 / ISBN-13: 9780134114026. That package includes ISBN-10: 0133913309 / ISBN-13: 9780133913309 and ISBN-10: 0133930645 / ISBN-13: 9780133930641. MyPoliSciLab should only be purchased when required by an instructor. American Government: Roots and Reform helps students view the issues facing the Unites States today through an historical lens. By presenting coverage of the origins of American government in tandem with material on contemporary political structures and behaviors, the authors help students see how what happened in the past can be used to understand what measures should be taken in the future. In order to boost student engagement with key concepts, the 2014 Elections and Updates Edition incorporates coverage of contemporary issues that dominate today’s headlines, as well as the most up-to-date data. MyPoliSciLab for the American Government course extends learning online, engaging students and improving results. Media resources with assignments bring concepts to life, and offer students opportunities to practice applying what they’ve learned. And the Writing Space helps educators develop and assess concept mastery and critical thinking through writing, quickly and easily. Please note: this version of MyPoliSciLab does not include an eText. 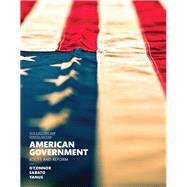 American Government: Roots and Reform, 2014 Elections and Updates Edition is also available via REVEL™, an immersive learning experience designed for the way today's students read, think, and learn. Karen O’Connor is the Jonathan N. Helfat Distinguished Professor of Political Science and the Founder and Director Emerita of the Women & Politics Institute at American University. Before coming to American University, Karen taught political science for seventeen years at Emory University in Atlanta, Georgia, where she was the first woman to receive the university’s highest teaching award. She has been recognized by several associations as the most outstanding woman in political science and public administration as well as by the Southern Political Science Association (SPSA) for her contributions to the discipline. She has served on the American Political Science Association (APSA) and SPSA councils and as chair of the Law and Courts and Women and Politics Research sections of the APSA. Larry J. Sabato is the founder and director of the University of Virginia Center for Politics. A Rhodes Scholar, Sabato has taught more than tens of thousands of students in his career at Oxford University, Cambridge University, and the University of Virginia. At the University of Virginia, Sabato has received every major teaching award, including the university’s highest honor, the Thomas Jefferson Award. In 2013 Prof. Sabato won an Emmy award for the documentary Out of Order, which he produced to highlight the dysfunctional U.S. Senate, and in 2014, Professor Sabato received a second Emmy award for the PBS documentary based on his New York Times bestseller The Kennedy Half-Century. Sabato directs the Crystal Ball website, which has an unparalleled record of accuracy in predicting U.S. elections. For more information, visit http://www.centerforpolitics.org. Alixandra B. Yanus is Assistant Professor of Political Science at High Point University, where she teaches courses in American government and gender and politics. She is also co-director of the Women and Gender Equality (W.A.G.E.) Leadership Project. She holds a B.A. in Political Science from American University and a M.A. and Ph.D. in Political Science from the University of North Carolina at Chapel Hill. Her scholarly research has been accepted for publication in peer-reviewed venues including Social Science Quarterly, Politics & Gender, and Women, Politics, & Public Policy, and in book chapters published by Oxford University Press, CQ Press, and Sage.